I am pleased to see that an increasing number of Golf Committees and golf course owners now request players to carry a bag or bottle of sand/seed mix during their round, for use in repairing divot damage that has been made by them or other players. There is no doubt that in most cases the immediate repair of divot holes by with a sand/seed mix promotes the fastest recovery possible. Note that I am not getting into correspondence as to whether this is necessary on courses with Bermuda or other grasses, as it is not my area of expertise. Nor am I going to address the hoary old issue as to why there is no relief from divot holes (and never will be! ), as I have already covered that subject in this blog. Q. 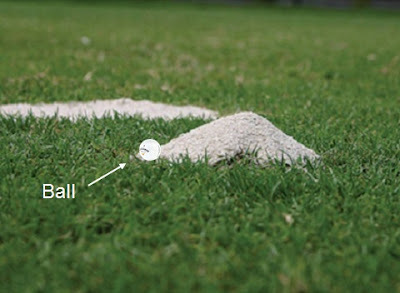 A player's ball lies in a sandy area through the green and there is a mound of sand a few inches behind his ball. The player makes his stroke and in the process he removes the mound of sand with the clubhead on his backswing, improving his lie. Is the player subject to penalty? A. No, provided that he did not ground his club other than lightly and that he took a normal backswing. Of course, once the stroke has been made the player should then flatten the remaining mound of sand for the benefit of those players who follow. I am pleased to recommend a great new resource for all golfers. The R&A has made the ‘Official Decisions on the Rules of Golf 2016/2017’ available as a free app for iPhone, iPad, Android and Windows 7. The developer, Aimer Media Ltd., has done a great job on this easy to use app, which everyone with an interest in the Rules should download. (Edit 5th Apl 2016: It has been brought to my attention that the Android version will not be available for a few more weeks). For those of you who prefer a hard copy, please use this link to purchase, as I will then make a few cents affiliate commission, which helps me to meet my costs.